Floyd Mayweather tries pro wrestling, just like Muhammad Ali did. Floyd Mayweather follows the Muhammad Ali career path … by climbing into the wrestling ring? On Sunday night, boxer Floyd Mayweather made his pro-wrestling debut at Wrestlemania XXIV. After a rote series of punches and chokeholds, Mayweather defeated his mammoth opponent, the Big Show, by resorting to the standard arsenal of dirty fighting: groin shots, brass knuckles, and that fail-safe weapon of the dastardly wrestler, the folding chair. Weeks of hype preceded the showdown, including spots on Larry King and Conan O’Brien, with much of the time devoted to whether Mayweather was really getting $20 million. Whatever amount Mayweather took home, it was too much—once the event was under way, it seemed like both men wanted it to be over. Why was the world’s best pound-for-pound boxer wrestling in the first place? Pro wrestling might seem like an odd career move for a real fighter, but it wasn’t a surprising development for boxing connoisseurs. Floyd Mayweather’s foray into the world of turnbuckles and body slams is in keeping with a grand tradition that dates back to turn-of-the-century champs like Ruby Robert Fitzsimmons and the great Jack Dempsey. The wrestling bug even bit the greatest fictional boxer of all time, Rocky Balboa, who took on Hulk Hogan (aka Thunderlips) in Rocky III. But the precedent that’s most relevant to Mayweather’s case is that of the Greatest of All Time. In 1976, Muhammad Ali tangled with Japanese wrestler Antonio Inoki. The hypemen: Vince McMahon Sr. and Jr. of the World Wrestling Federation. In the past year or so, Floyd Mayweather has catapulted himself from mere boxing stardom to a level of pop-cultural notoriety that’s quite rare for a fighter these days. In doing so, he’s helped lift his entire sport out of the doldrums, all with an act that looks and sounds an awful lot like the one perpetrated by a young loudmouth from Louisville, Ky., named Cassius Clay. When Ali, then Clay, first emerged in the early 1960s, boxing’s obituary was being written in the sports pages. Television had destroyed the subculture of local clubs, and the bland, unpopular Floyd Patterson had recently lost the heavyweight title to an even less popular fighter, glowering ex-con Sonny Liston. Beloved stars like Rocky Marciano and Sugar Ray Robinson were retired or in decline, and no bright lights were emerging to take their place. Enter Ali, riding his good looks, fast hands, and loquacious Louisville Lip to fame. This flamboyant shtick—a charismatic young fighter reveling in the role of the cocky black braggart—was a shot in the arm for the sweet science. In later years, Ali admitted that he stole large parts of his act, including the “greatest of all time” bit, from Gorgeous George, a legendary pro wrestler of the 1940s. Of course, for Ali, playing the self-adoring villain was a gesture of racial defiance as well as a promotional tactic. Now that he’s been all but sainted, it’s easy to forget how much of Ali’s fame grew out of the fact that the white middle class hated him and tuned into his fights in the hopes of seeing the Louisville Lip buttoned once and for all. Floyd Mayweather courted a similar kind of infamy last May in his mega-fight with Oscar De La Hoya and in the behind-the-scenes series that HBO aired to hype it, 24/7. Though De La Hoya, boxing’s pay-per-view king, was by far the marquee attraction going into the bout, Mayweather stole the show, positing himself as a new version of Ali updated for the hip-hop generation. “I’m the greatest of all time” morphed into “I’m the richest of all time,” and the Money May persona was born. With 50 Cent a regular companion in his ever-present posse, and with money-flinging and self-adulatory boasting his two favorite public activities, Mayweather donned the black hat of black defiance, selling his life, attitude, and style as a reflection of the values of the most banal rap videos. Just as it did for hip-hop, this gangsta lean pushed Mayweather’s fights to the top of the charts. 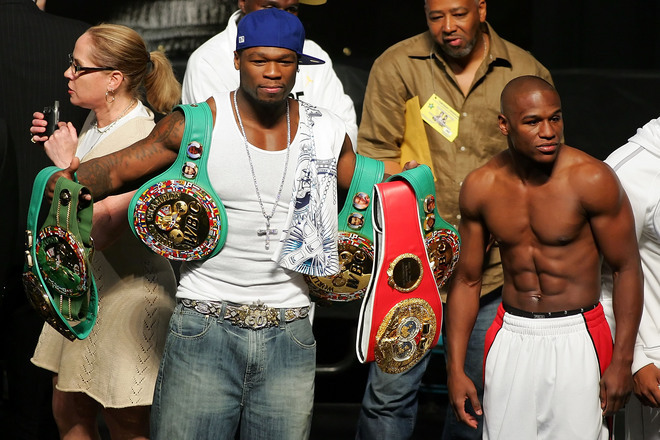 De La Hoya/Mayweather became one of the most profitable events in pay-per-view history. The comparable success of Mayweather’s bout with Ricky Hatton later in 2007 made it clear that it wasn’t just Oscar who was responsible for all that cheddar. The lesson: If you want to open like Star Wars, you need a Darth Vader. The fans booed and hissed and rooted for his downfall, and just like Ali before him, Money May laughed all the way to the bank. Less than a year later, however, Mayweather already seems trapped inside a monster of his own making. The “mo’ money” vaudeville act has gotten old fast, and Mayweather doesn’t seem to know what to do with it. All he does seem to know is that he wants to be a superstar of the sort that boxing hasn’t known since Sugar Ray Leonard, and to achieve that, he’s getting admirably creative: appearing on Dancing With the Stars, playing in the NBA Celebrity All-Star Game, regularly floating the idea that he’ll turn away from boxing and pursue a career in mixed martial arts. And now Wrestlemania. It’s as if he’s trying to emulate both acts of the Ali drama at once—the self-conscious villainy of the Louisville Lip era and the multiplatform cartoon character of the mid-1970s for whom boxing was only a small facet of a gigantic media creation. By the 1970s, Ali had transformed into the good guy. Thanks to a series of epic fights, the vindication of his position on Vietnam, and a genius for selling himself, the most loathed of heels became the hero of heroes and the face of a generation. To follow in those mighty footsteps, Mayweather has a long way to travel, indeed, and one has to wonder if circumstances and his own skill set ever will allow for such a metamorphosis. As a fighter, Floyd Mayweather is astonishingly gifted and deserves mention in Ali’s exclusive class. But as far as charisma goes, Ali vs. Mayweather is a historic mismatch. The Greatest of All Time could play any role, going from villain to hero or clown to sage, sometimes in the space of a single rambling sentence. To this point, Mayweather hasn’t demonstrated such dramatic range nor the depth and savvy it takes to emerge from a typecast villain into a full-fledged leading man. It’s a trick that not even World Wrestling Entertainment could perpetrate on its fans. In the initial promotion for Mayweather’s Wrestlemania appearance, he was positioned as the noble David in a David-and-Goliath showdown, defending the honor of the popular Rey Mysterio against the 7-foot Big Show. But there was a problem with this “Floyd the Courageous,” a plain fact repeated over and over again by various wrestlers and commentators—nobody likes Floyd Mayweather. In the face of this realization, the WWE brain trust, never shy about tinkering with the forces of good and evil, recast the fighter in a darker but much more familiar light: the cocky braggart with a posse of thugs. And so it was Sunday night, the crowd roaring when it appeared that Big Show was going to finish Floyd, then booing when Floyd turned the tables and used some hastily produced brass knuckles to do the finishing himself. It was a bizarre and lackluster affair, and in that way warrants Floyd yet another comparison to Ali, whose wrestling bout with Antonio Inoki was a lifeless travesty. Of course, at that point Ali had earned himself a pass or two from the adoring public. That Mayweather wants such affection for himself is clear, but the way he’s going about getting it isn’t working. You’d think Mayweather, having stolen so readily from the Ali playbook, would understand that on history’s stage only the bit players are bad guys. The big stars always play the good guy in the end.